The Nemeziz, Ace, X and Copa boots have all been given a flared-up makeover, as the best footballers on the planet look set to show off the latest adidas creations. It seems that orange is certainly the new black for the guys over at adidas. Following on from their hugely popular “Ocean Storm” and “Thunder Storm” boot packs, they’ve gone ahead and unleashed a fired-up iteration of the series. Gone are the deep blues, greens and flamboyant yellows of the previous designs, as adidas have managed to create a stunning set of football boots that are just too hot to handle. You’ve undoubtedly already seen some of your favourite players sporting new adidas designs across Europe this season. The likes of Paul Pogba, Roberto Firmino and Dele Alli have all acted as poster-boys for the adidas packs released over the summer, and these same players will already be preparing to take to the pitch in these new designs. Leo Messi introduces the new Pyro Storm #NEMEZIZ. The “Pyro Storm” pack follows the themes set by its predecessors- by offering a fresh new design to the Nemeziz, Ace, X and Copa boots. These boots offer a little something for every kind of player, meaning that you’re bound to find something in the “Pyro Storm” collection to suit your style of play. So, where shall we start? The all-new Pyro Storm #X17+ Purechaos. The “Pyro Storm” X 17 is all about unleashing your blistering pace, with players such as Gareth Bale and Gabriel Jesus set to wear a pair of these after the international break. Incorporating a lightweight design, the innovative adidas Sprintframe outsole and a Purecut laceless upper, the X 17 gives players everything they need to burst past defenders. The dynamic compression upper moulds perfectly to the shape of your foot too, so you won’t have to worry about wearing them in before matchday! The new design features a black and orange colourway, with fiery logos and patterns creating a truly dazzling design. The black template is completely covered in eye-catching orange dots, creating a kind of flaming disco ball appearance which is unlike anything else in the “Pyro Storm” pack. The all-new Pyro Storm #ACE17+ Purecontrol. We should all know by now that the adidas Ace collection is all about mastering control and dictating the play on the football pitch. If you dream of one day playing like Paul Pogba or Dele Alli, then you seriously need to check out the new “Pyro Storm” editions. Incorporating ground-breaking technology that enhances grip in all kinds of weather conditions, and engineered knit zones that provide an incredibly comfortable fit, it’s not hard to see why the Ace has proven so popular in Europe’s top leagues this season. Just like the other designs in the “Pyro Storm” pack, the Ace 17 utilises a fiery black and orange colourway that certainly doesn’t fail to catch the eye. Complete with gold detailing around the black stripes and slightly fading shades of orange, this is the perfect football boot for any playmakers this autumn. The all-new Pyro Storm #COPA17. In many ways, the new “Pyro Storm” Copa designs stands in complete contrast to the Ace. Once again featuring a black and orange colourway, it’s clear to see that black is the predominant colour here, with orange details adding a dash of character. This makes for a more subdued, classier creation which perhaps doesn’t catch the eye as fervently as the other “Pyro Storm” boots. With red trim on the heel and collar, and dazzling orange stripes, these boots are perfect for any players that want to try out the new designs without drawing too much attention to themselves. That being said, the Copa is engineered to help you outclass everyone else on the football pitch, so it won’t be long until your style of play will be catching the eye instead. Introducing the all-new Pyro Storm #NEMEZIZ. Last but certainly not least, the infamous Nemeziz 17 has been given its own flaming make-over as part of the “Pyro Storm” pack. As one of the biggest football boots on the planet right now, there’s little wonder as to why fans and players alike are positively giddy with the new look. 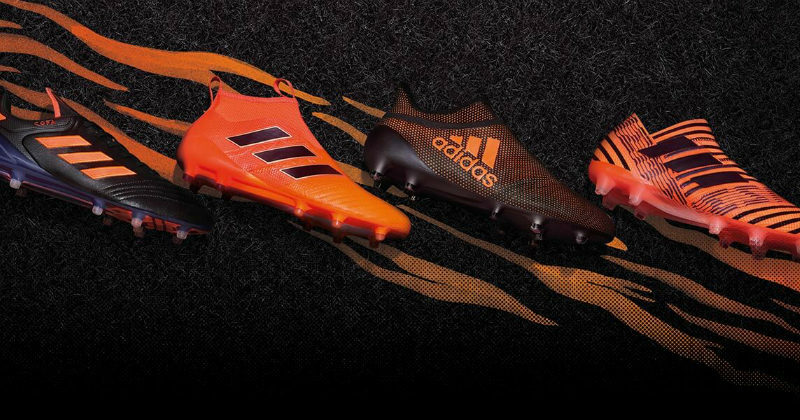 Incorporating a dazzling black and orange striped design, the new boots look set to be worn by some of the biggest players on the planet. Roberto Firmino and Julian Draxler are just two examples of the calibre of player you can expect to see showing off a pair of these babies, while a certain Lionel Messi has been given his very own signature colourway. This slick new design isn’t all about the tiger-print appearance though, as it still utilises the same 360 Agility Bandage technology as the originals, allowing wearers to change direction quickly and burst into those little pockets of space. So what do you reckon to the new designs? Are they a little too colourful or right up your street? Let us know in the comments! If that wasn’t enough, you’ll be pleased to know that you can get your hands on a pair of these stunning football boots at a fraction of the price right here! We compare prices from the biggest online retailers, so shop the “Pyro Storm” pack with us today to snag yourself a bargain! Embracing the January theme of black colourways, adidas have given all their big four silos a makeover. The Predator, Copa, X and Nemeziz have all been given fresh updates. But are they worth buying?